Br. Raymond F. Wilken, CSV, died Aug. 17, 1958 of a heart attack at Resurrection Hospital in Chicago, after suffering from a heart ailment for the previous ten years. He was 52. Br. Wilken was born on July 6, 1906 in Bradley, IL. He grew up in Kankakee and was introduced to the Viatorians at St. Patrick Church, his home parish. He attended St. Patrick’s High School from 1924-1928. As a young man in 1929, he entered the Viatorian novitiate in Bourbonnais, IL. Br. Wilken professed his first vows on September 12, 1930 in Lemont, IL. From 1930 to 1932, Br. Wilken managed the dining rooms for students and faculty members at Cathedral Boys’ High School in Springfield, before moving to Canada, where he taught English. Br. Wilkin taught students at Ecole Superieure St. Viator in Montreal from 1932 to 1936 and at the College of Beauharnois, Quebec from 1937 to 1939. It was during this time that he professed his final vows on Jan. 6, 1935 in Joliette, Canada. 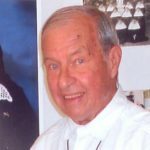 In 1940, he was called back to his own province to work among paroled convicts at the Catholic Youth Organization hotels in Chicago under the direction of Bishop Bernard Sheil, who founded the organization in 1930. Here, Br. Wilkin supervised boys and took an active part in the administration of the organization. His next assignment from 1944 to 1949 was at the provincial house on Sheridan Road in Chicago, where he assisted with financial records and managed the kitchen. It was here in 1948 that Br. Wilken suffered his first heart attack, of which he only partially recovered. Br. Wilken had a strong faith in God’s holy church and in the priesthood of Christ. This enabled him to see God everywhere — in the problems and sorrows of life, in the various works of the congregation and in his own personal trials and crosses. In 1949, Br. Wilken resumed his work back at Cathedral Boys’ High School in Springfield, until returning in 1958 to the Viatorian Mission House in Arlington Heights. Br. Wilken is buried in the Viatorian plot at Maternity of the Blessed Virgin Mary Cemetery in Bourbonnais, IL.